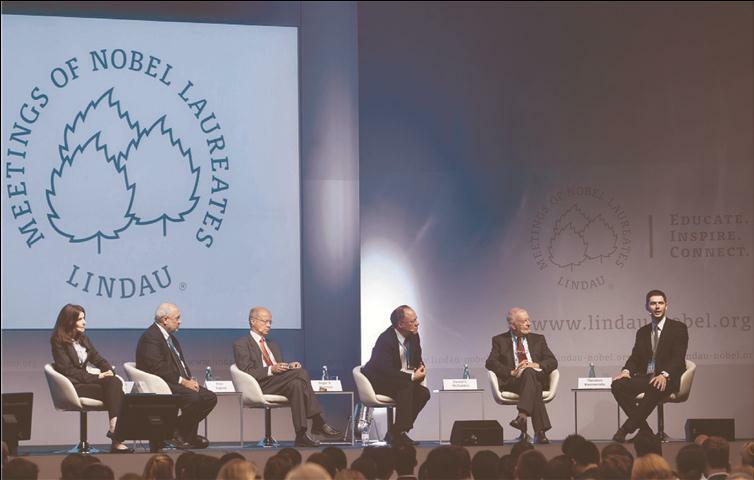 University of Warwick Department of Economics PhD student Theodore Koutmeridis was recently honored at the Lindau meeting in Germany, where he was chosen to participate in a high-profile panel discussion with three Nobel Laureates. Koutmeridis was one of two students selected to share the stage with Nobel Laureates Daniel McFadden, Roger Myerson and Joseph Stiglitz for a wide-ranging, intergenerational panel discussion on “Sustainability in International Economics.” The other PhD student who participated was Stefanie Stantcheva from the Massachusetts Institute of Technology. The Lindau meetings provide a globally recognized forum for the exchange of knowledge between Nobel Laureates and some of the field’s most promising, young researchers. The meetings on economic sciences, which took place in late August, brought together 17 economics laureates and more than 350 young economists representing 65 countries. The young economists were selected from a field of more than 5,000 applicants. A focus of this year’s meetings was the future of economics, both as an academic discipline and as a reference for the political decision-making process in the context of current world economic trends. A key question for the recent gathering concerned the possible direction the economies of the world may take now, with nations still reeling from the aftereffects of the 2008 financial crisis and the eurozone in crisis. Koutmeridis is a third-year Warwick PhD student who has won awards for both research and teaching. He studies macroeconomics and labor economics from both empirical and theoretical perspectives, with a focus on both wage inequality and market failures. Warwick PhD student Theodore Koutmeridis, seated at far right, participated in a panel with three Nobel Laureates at the recent Lindau meetings in Germany. Pictured, from left to right, are the members of the panel: Stefanie Stantcheva, an MIT PhD student; 2001 Nobel Laureate Joseph Stiglitz; Panel Chairman Peter Englund, secretary for the Committee for the Prize in Economic Sciences in Memory of Alfred Nobel, Sweden; 2007 Nobel Laureate Roger Myerson; 2000 Nobel Laureate Daniel McFadden; and Koutmeridis. Photo courtesy of The Nobel Laureate Meetings at Lindau.